Leicester City and Algerian play-maker Riyad Mahrez who beat Dortmund striker Pierre Aubameyang to African player of the year award has become the first African to win the PFA, BBC and CAF player of the year in the same year. 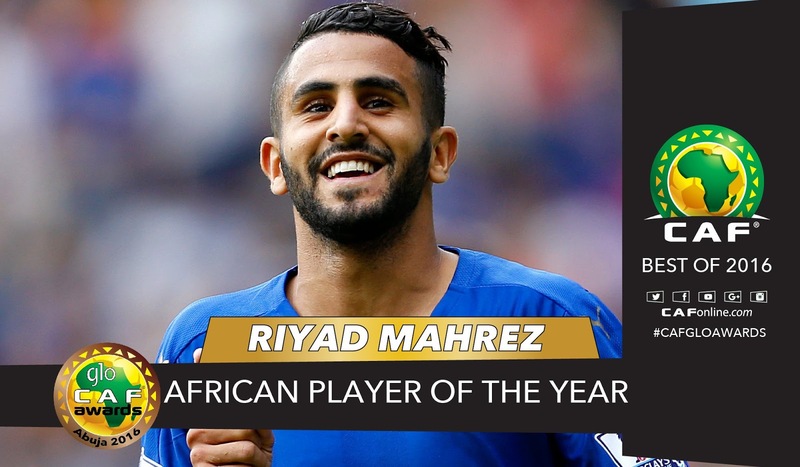 Riyad Mahrez was named 2016 CAF African player of the year today in Abuja after securing a total of 361 votes to beat last year’s winner Pierre Aubameyang who finished with 313 votes, while inform Liverpool winger Saido Mane finished third with 186 votes. 2016 was a phenomenon year for Riyad Mahrez, having won an unexpected league title with Leicester City the Algerian became the first African to be named PFA player of the year. He was also named BBC African player of the year 2016, while also making the top 10 in FIFA Ballon d’Or. Riyad Mahrez is the 1st North African player to be named African Player of the Year since 1998 when Mustafa Hadji beat Jay Jay Okocha to the award.